The Sony MDR-XB450 has a 30mm driver with a frequency response of 5Hz-22000Hz. will be available in five colors - black, white, red, blue and yellow. The MDR-XB450, made of metal, features a swivel folding style and a flat serrated cord. 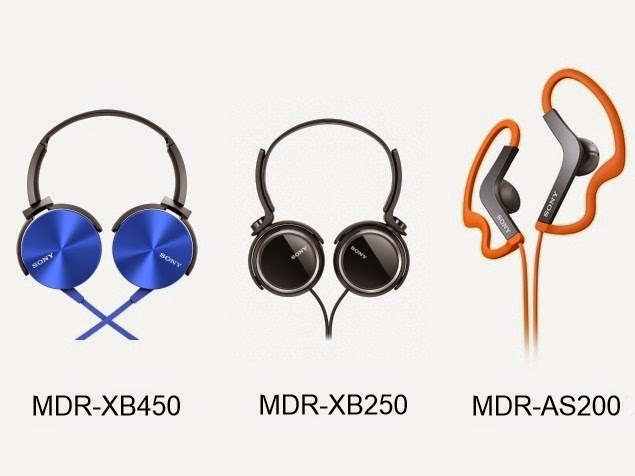 MDR-XB250 also has a 30mm driver, a swivel folding design and a flat serrated cord like its elder sibling, and appears to be nearly identical to the XB450 expect for the metal body. MDR-AS200 earphones, built for extreme sporting activities, have an adjustable ear loops and the same flat cord. They have 13.5mm drivers and a water-resistant design.